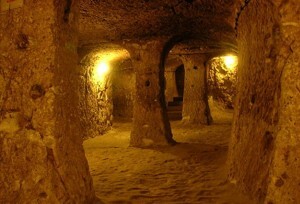 Derinkuyu is a Turkish multilayered underground city. It consists of no less than 5 different layers,, and a total of 13 different floors, and it could have been sealed from the interior with a number of large stone doors. Thus, it is believed that during periods of siege, when invaders entered the region, as much as 20.000 people could go inside and escape any pending threat that was immediate. In order to allow such a large population to survive for extended periods of time underground, the city complex had storage areas, was supplied with water and it allowed easy passage from one area to the next one through interconnected passage ways. Within its space there are utility areas meant for the storage of beverages, wine and oil, most probably, stables for animals and also chapels and refectories. However, given the complexity of the building, the fact that most of the rooms were built to exact specifications and inside a very tough rock, volcanic in nature, has posed many questions as to the technology used to design the entire complex. There are theories according to which the entire complex was built using tools that exceeded the capabilities of the Turks of the period, as the carving and the entire structural complexity of the construction is extremely detailed and carefully planned out. But Derinkuyu is not a singular occurrence; the area is full of other, less complicated city within cave systems which showcase similar styles of carving and construction, though for the most part none is as complicated and as complex as Derinkuyu. There is no hard evidence to showcase that the underground complex is actually nothing other than a very complex human made construction, but that hasn’t kept many from speculating, especially given the almost perfect way in which the tunnels were carved.